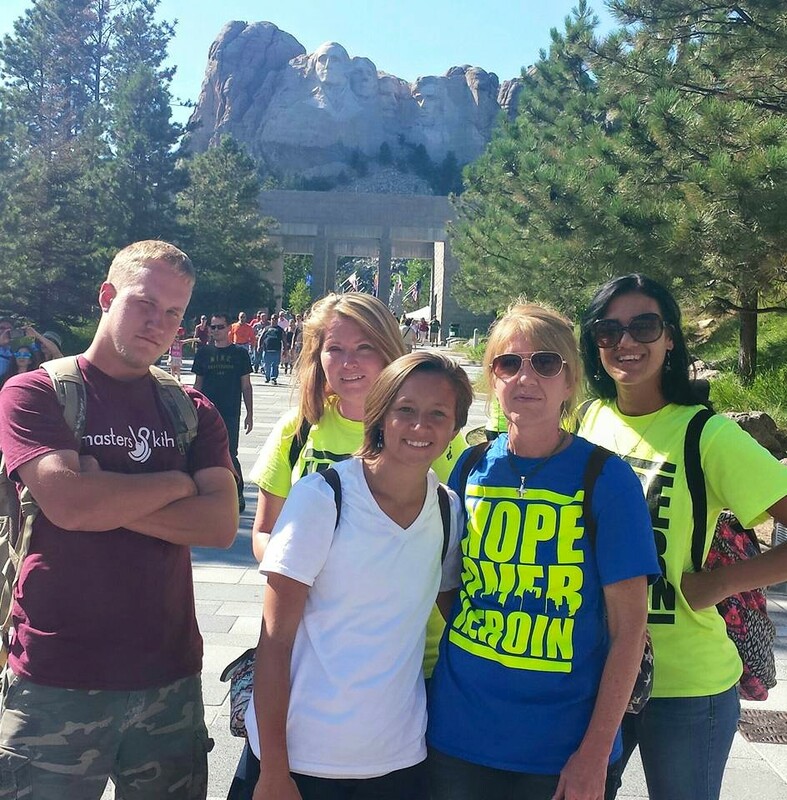 On July 26th, 2015 around 9:30 pm, after the evening church service, approximately 41 prayer warriors, from 3 different churches, loaded up a bus to head to South Dakota. If I was to say it was a pleasant ride there with everyone singing, laughing and loving one another, I would be lying. The lessons in being grateful, not getting easily offended and preferring our bother over ourselves started before we even got out of Ohio. But in retrospect, we did very well for such a blended group of personalities. I believe we all came home a little more tolerant, loving and accepting of one another and our differences. And I believe we all learned a lot about ourselves, I know I surely did! The weeks leading up to our journey I had one main prayer “Start arranging some divine appointments. Put people in our paths that our efforts will not be wasted upon; people that will carry the spark with them after we leave, those that will fan the flame after we’re gone.” God did just that! I believe everyone on the trip had their own divine appointments. I haven’t even got to hear about a fraction of them yet. I do know my friend Aaron was gone most of the week ministering and building relationships with the young men as he umpired their baseball games and made friends with some of the local men. I watched my dear friend Andrea love on little girls who had just lost their momma in a car wreck the week before as well as other little ones who needed and craved the hugs and love she so generously handed out. I watched her from afar with a knowing, she was changing little lives, giving them hope. Another new friend of mine formed a special bond with a local family. As we were leaving, the man gave him his bible. It wasn’t just any bible. He had once been in a gang and he and a member of a rival gang had fought and tried to kill one another. Years later they met up and both were saved and living for the Lord. The one man gave the other his bible; it was handed on to my friend Scott before we left. 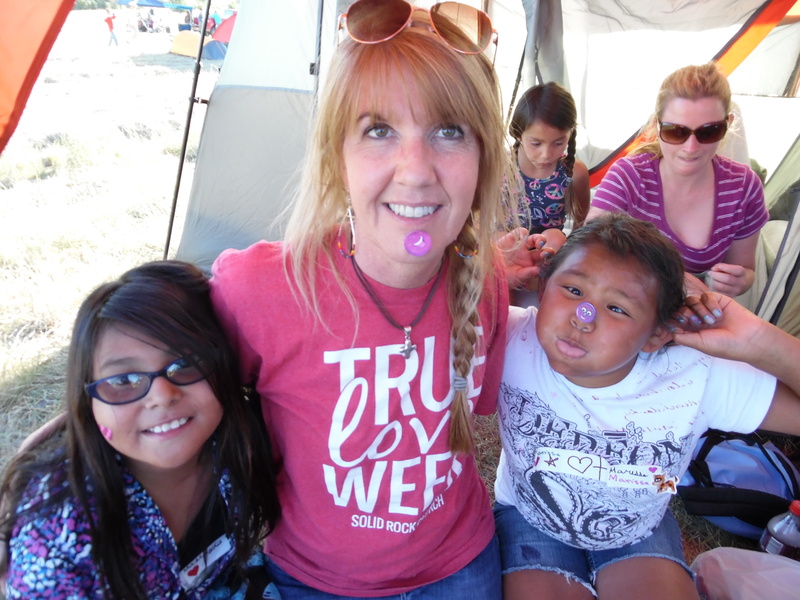 These are just a few of the highlights that came out of our journey to Pine Ridge. Everyone has their own stories to share that are inspired and amazing. 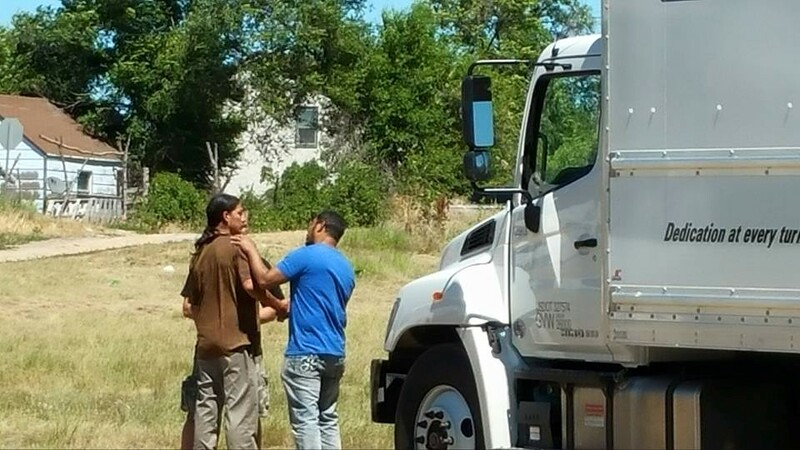 In the next few paragraphs, though words will likely fail, I will try to capture those special moments where God moved through me, leading me to divine appointments on my journey to Pine Ridge. 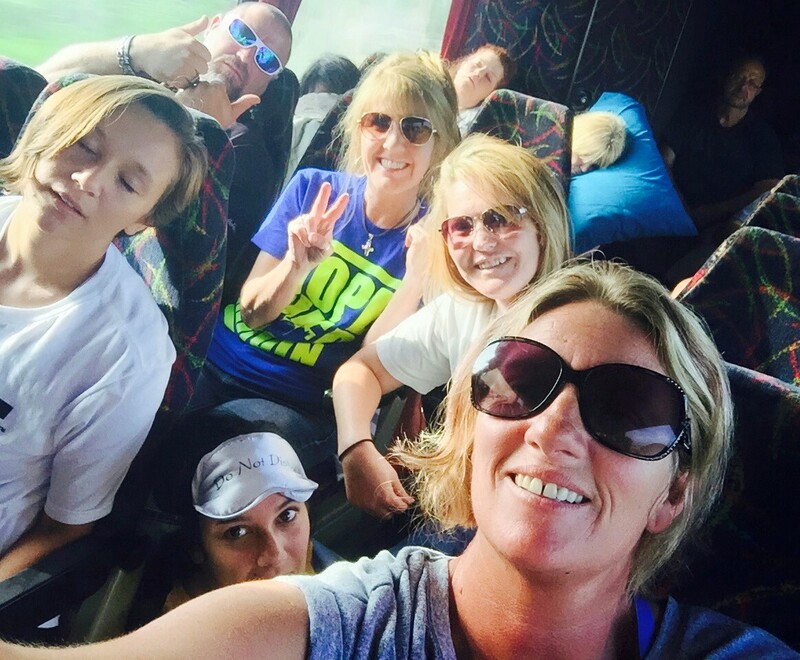 Day 1: Sunday, July 26th – We were not that far out of town when we had to stop so the guys could fix a leak in the front of the bus from the rain coming down. We stopped at a place called the “Iron Skillet” which was a gas station/restaurant. I went in to the convenient station side and got a bottle of water. As I was paying I made eye contact with the girl behind the counter. God started to move, I felt it. She asked me where we were headed and what we were doing. Then the words just came out, “Is there something you need prayer for?” She said “Yes! Please pray for my son.” I asked his name and how old he was. That’s when she said, “He died….” I wasn’t expecting that and my heart ached for her. I asked if I could pray with her right then, instead of for her when I left. She said she would like that as tears started to fall and we held hands across the counter in that gas station at midnight. In that moment I couldn’t tell you who was in line, who was looking, and I didn’t care. I held her hands and prayed for God’s peace to surround her, for his strength to carry her through as she grieved the loss of her young son. She said she knew Jesus, she had been raised in church but it had been awhile since she’d been there; but she intended to start going again. Thank you God for my first divine appointment! As I walked back to the table where my friends were sitting in the restaurant I was marveling at how God uses those who seek the opportunity to show his love and that’s when I saw others in my group holding hands and praying with the waitress. After the prayer was over, she told them how she had lost her faith when her believing father, who was a police officer, had been killed. But she had recently started attending a local church again. God was already moving and we were not even 2 hours out of Ohio yet! 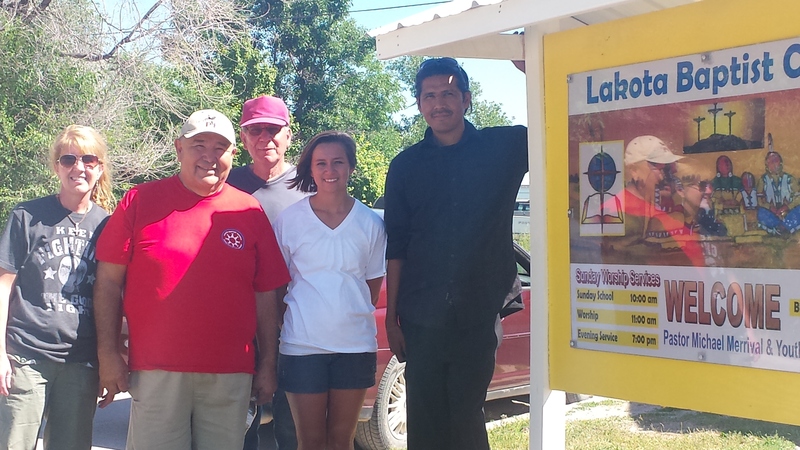 Day 3: Tuesday, July 28th – we reached our destination in Pine Ridge. It was early morning as we pulled into a field that looked to be about 5 acres, with one large shade tree. Out across the filed the crew had already started to set up the stage for the events that would be held that week. 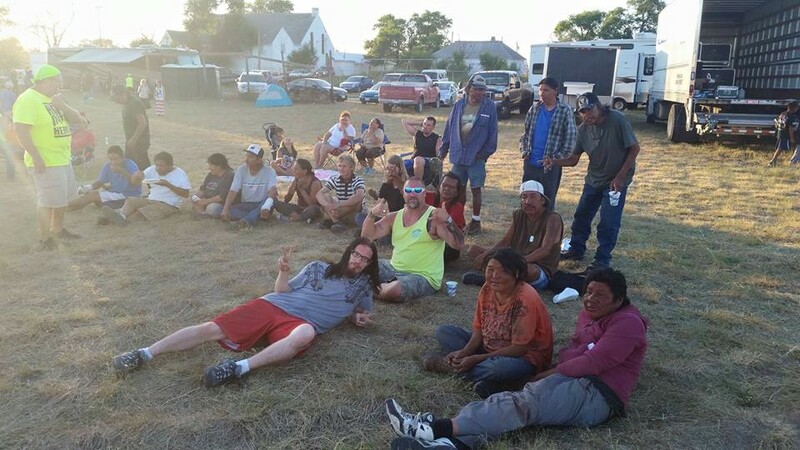 The Warriors Circle Mission Team is working to unite the Lakota tribes and we were there to help and serve them. Little children were already in the field when we arrived. After we set up our “tent city” which would be our home for the next 4 /12 days, we went to the shade tree and met some of the children. 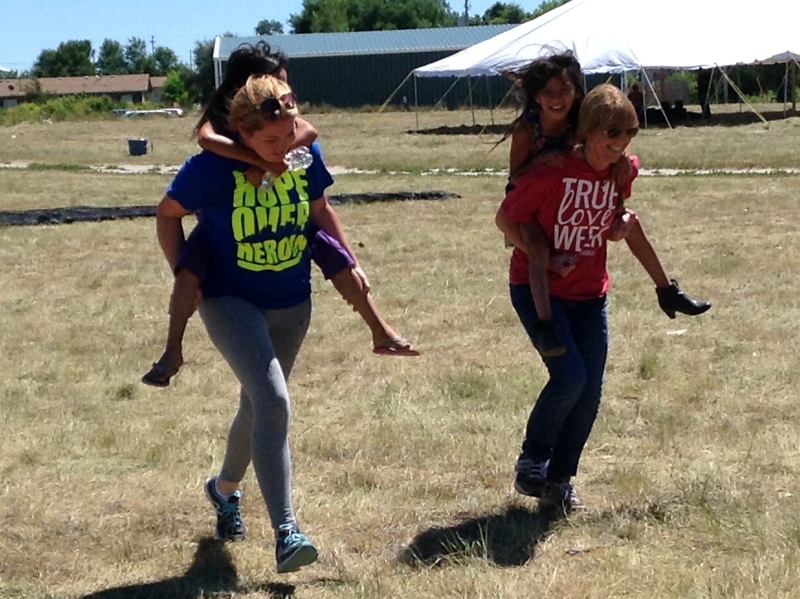 We played and laughed and loved on these little ones. While sitting in a circle talking, one of the little girls told me she had found her 15 year old sister, hanging from a rope. My heart broke in two as I prayed silently before praying out loud “Give me the words to speak to this little one.” Suicide is not uncommon in this community. 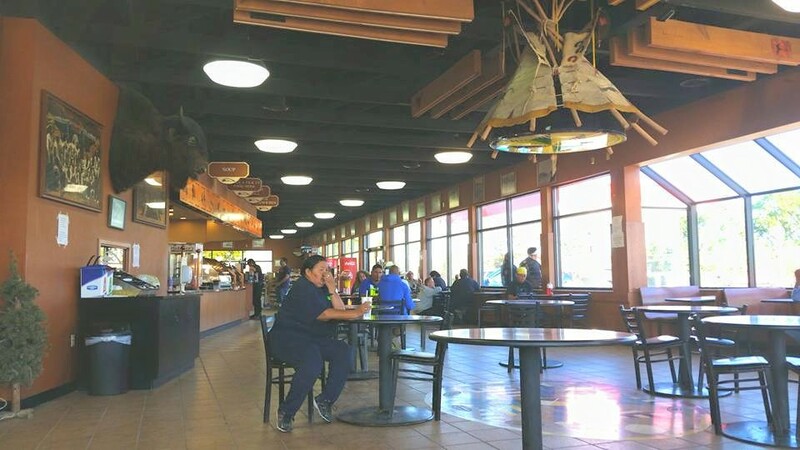 I was told by one of the local folks that the average age of a man on the reservation is 49 years old. Children are not immune to the awareness of alcoholism, abuse and suicide. After playing with the children for a bit and meeting with the elders of the tribes in the community, we went door to door to let people know that later that evening there would be an honoring of the elders, free food and music. I was blessed to go with Gerald, Jason and Alicia as we went as a team door to door to speak to the local natives. In the 2 or 3 hours we were out, we prayed with everyone we met and lead approximately 15 people through the sinners prayer. We prayed with young men at the skate park. We stopped at a house where a painter was working and a young man named Jacob came to the door. When we were done he came back out and we prayed with him as well. Even though he was likely 16 or 17, he still had a sweetness and innocence in his eyes. We spoke for awhile with a couple who was leery of us at first. After speaking for some time and then praying with them, before we left she opened a box ever so carefully and handed Alicia and I a pair of earrings. I was humbled and blessed! This was their livelihood, the items they used to make a living and they were giving them to us. The smiles on their faces were priceless! 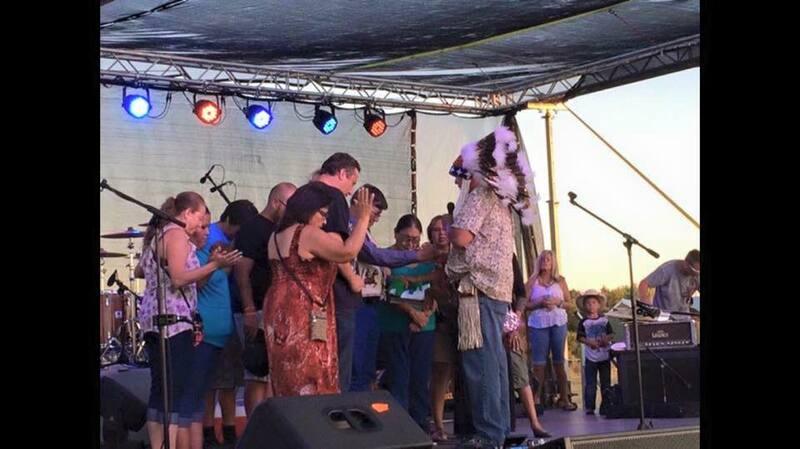 That evening after the concert and altar call there were healings that took place! Our bus drivers ear was healed, backs were healed, God was moving!! Day 4: Wednesday, July 29th – Another day of walking door to door with a small group of 5. 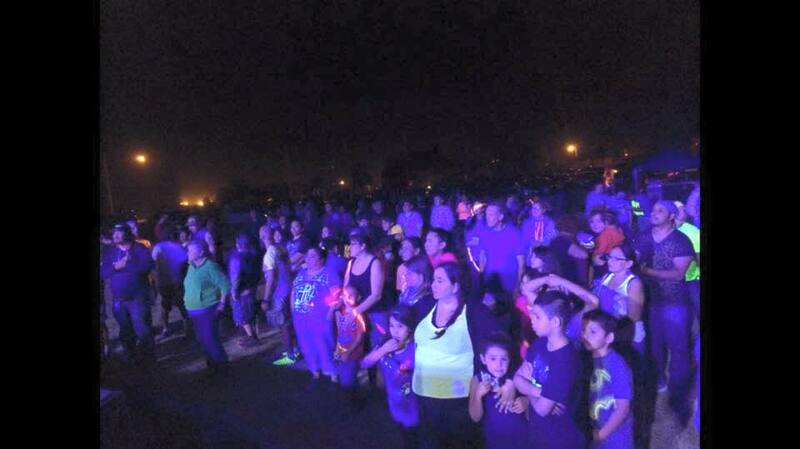 We were privileged to pray with so many people and I watched every one of us in that group grow and mature. 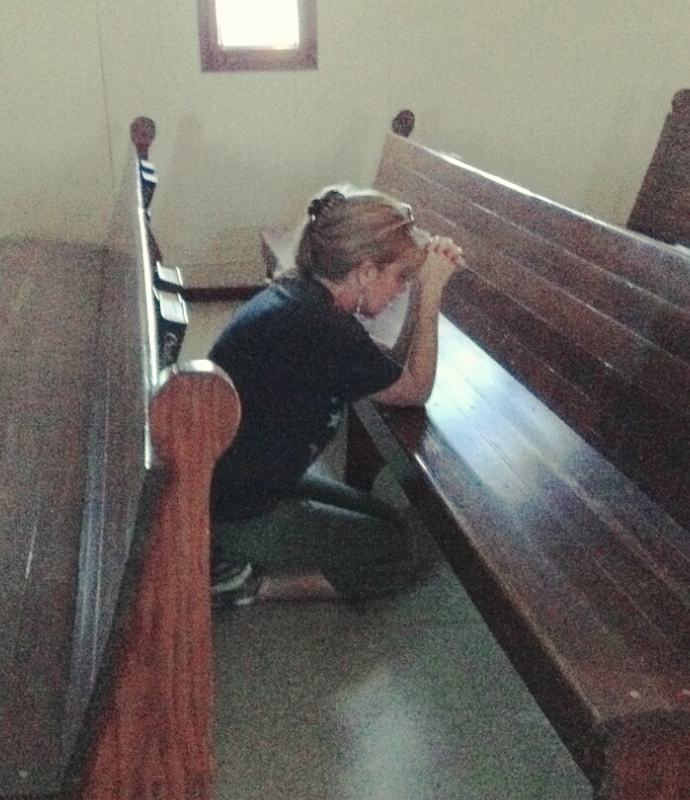 We were invited into one home where we prayed with a mother,her children and the grandmother. 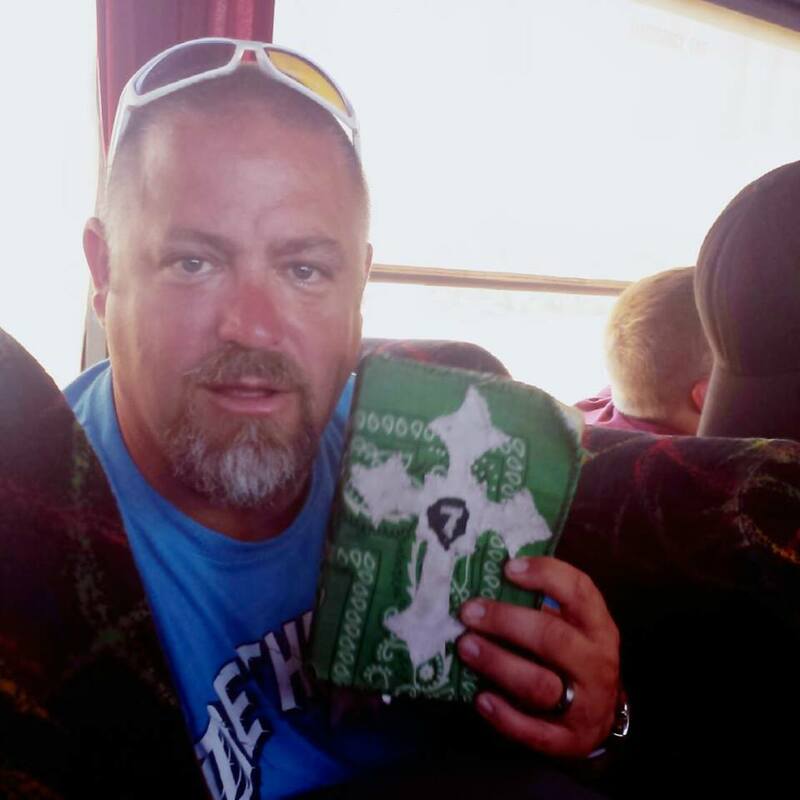 We met a young father walking home with a bag of diapers and prayed with him. It was so good to see walls coming down and people opening up to us. There are many who feel that those who accept Jesus and God are betraying the Indian Nation because the see it as a “White Man’s God”… but there are many who are starting to accept that he is a God of all colors, all nations and is no respecter of persons. 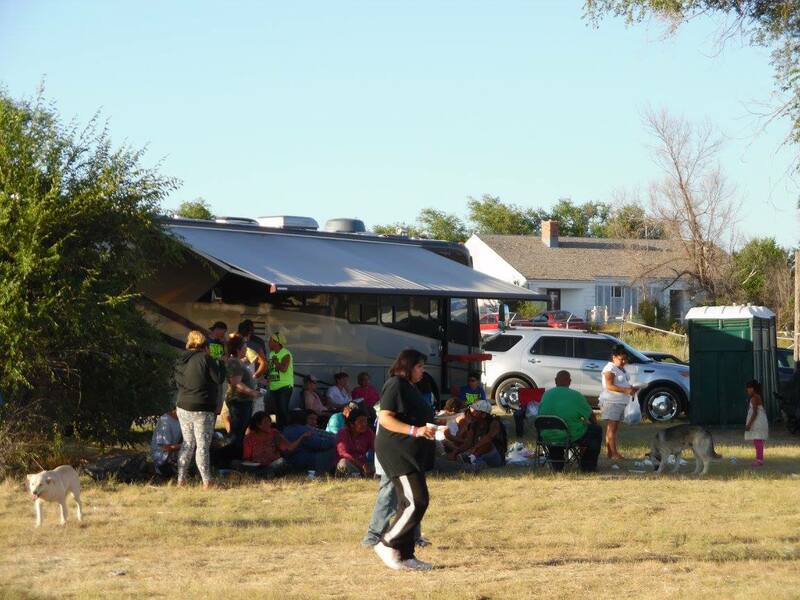 I was also blessed to help serve food from the camp site this day at lunch. Our Food Ministry team cooked from sun up to sun down serving two, free, hot meals a day to the local residents as well as our mission team. 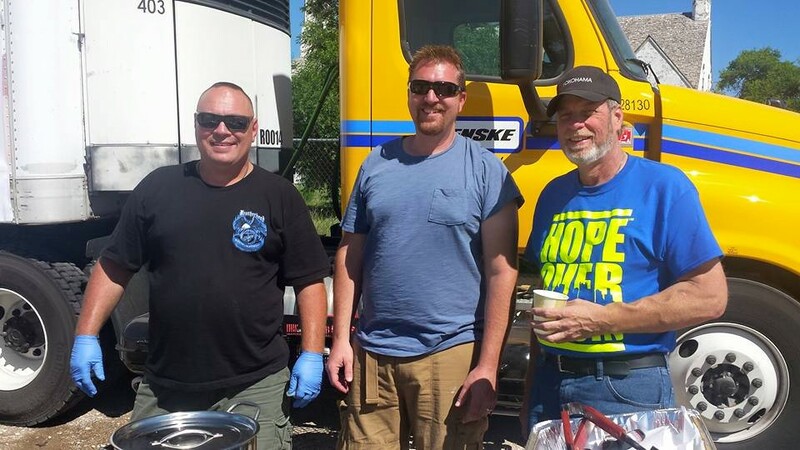 These men were amazing and put in a lot of long, hot hours to serve the community. I was blessed to serve along side them! Day 5: Thursday, July 30th – I woke up and actually said out loud “God I need some alone time with you today if you can make a way.” Pastor Lawrence once preached a sermon about “Going to the Mountain”. Telling how so many evangelists and preachers backslide or quit the ministry because they constantly go out into the world and give, give, give but they neglect to come back to the mountain and spend time alone with God and refill. To be effective, we have to give from our overflow. By Day 5, I was feeling quite drained and could see how someone who lives on auto pilot, constantly giving of themselves, can easily wake up with their spirit man starving. I was assigned to be a leader of a service project that day. I had 3 others on my team. 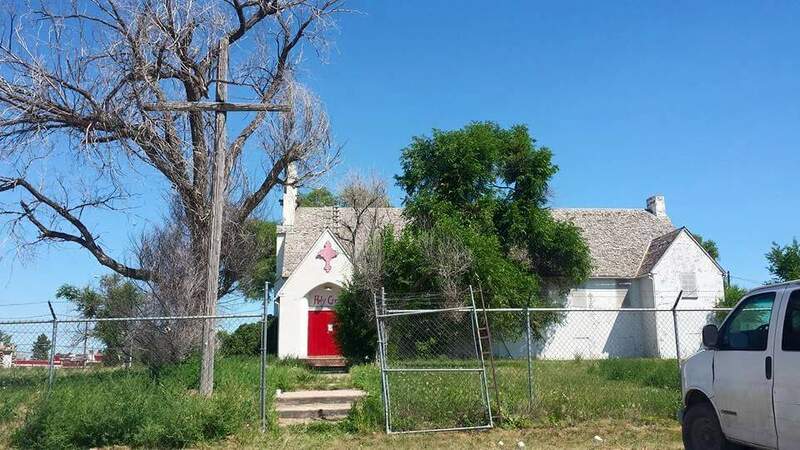 I was told we would be going to Lakota Baptist church to mow and weed eat. If I was being honest, in the 90+ degree weather that didn’t sound too fun – but I quickly reminded myself, we were here to serve! I spoke to Pastor Mike on the phone and he was waiting on us when we got there. We pulled up to find out that the yard didn’t need mowed and the weed-eating had been done. All we needed to do was pick up a little trash in the yard surrounding the church and sweep the sidewalks. He took us in to this beautiful little church. As I walked in “Amazing Grace” was coming from the sanctuary. Emotions started to rise as I felt God’s presence. That was the song I sang to my mother as I held her and she took her last breath. Just earlier that day her friend had sent me a message on FB “Your mom would be so proud of you.” I realized in that moment once again, her death gave me life. It inspired me to honor her memory by being the kind of Christian woman she was, and one she would be proud of. The next song? The Old Rugged Cross! I haven’t heard that song in sooo many years! 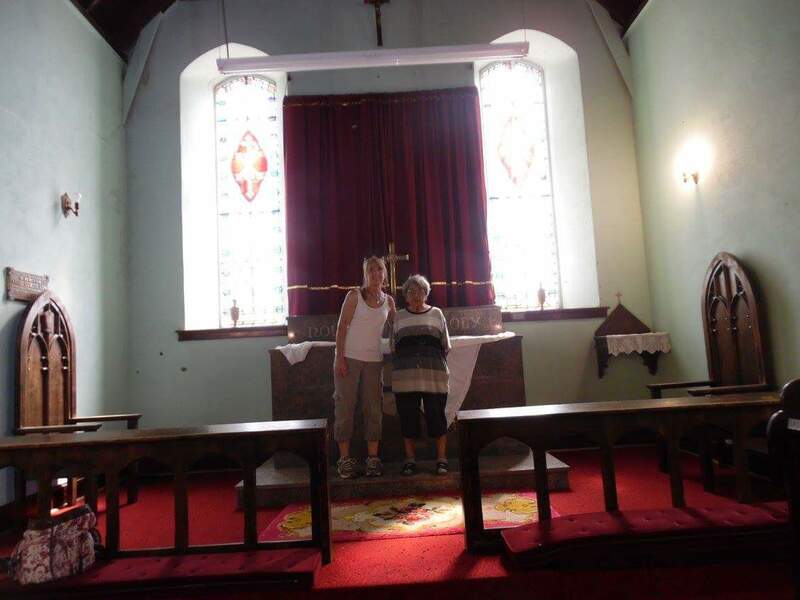 I instantly went back in time – to my mother sitting in that little country church in Centerfield, OH, not unlike this beautiful little church I found myself in, playing and singing that song. To my falling asleep at night to the sounds of my mom playing the piano downstairs and singing those old hymns. 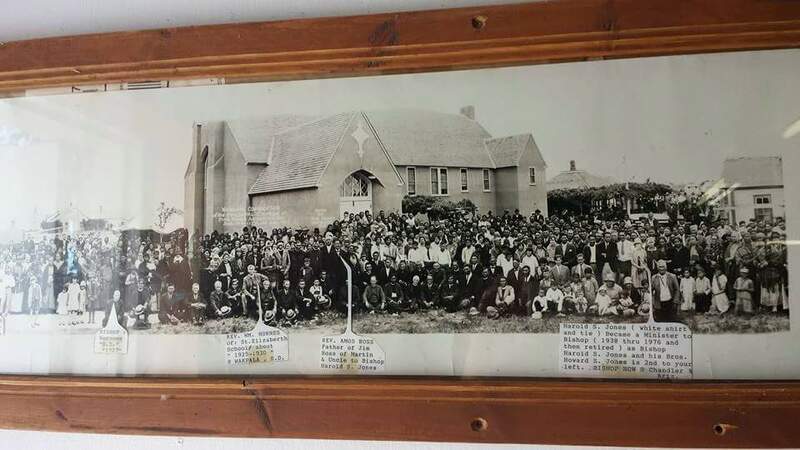 While all those thoughts were flooding me, I was listening to Pastor Mike tell us how he recently became the first Native American pastor of this church. How his battle was getting the locals to understand this is not a “white man’s God” but a God of all colors. They ensure the children are served a meal before they go home and send them home with bible verses and papers that they can share with their parents. When he was done speaking to us and answering all our many questions, I asked him “Can I please have time in your sanctuary when we are done with our project?” He so kindly obliged. As I picked up trash I spoke with Pastor Mike and was intrigued with his story. He has spoken in front of thousands and shared his testimony. He was shot 3 times at the Wounded Knee incident in the 1970’s and was declared Dead On Arrival at the hospital. The surgeons that put him back together said it was the hand of God. He is a walking miracle. I knew this newfound friend was a connection I would keep, even after I left. That evening at the altar call, many came forward once again to surrender and give their hearts to the Lord. 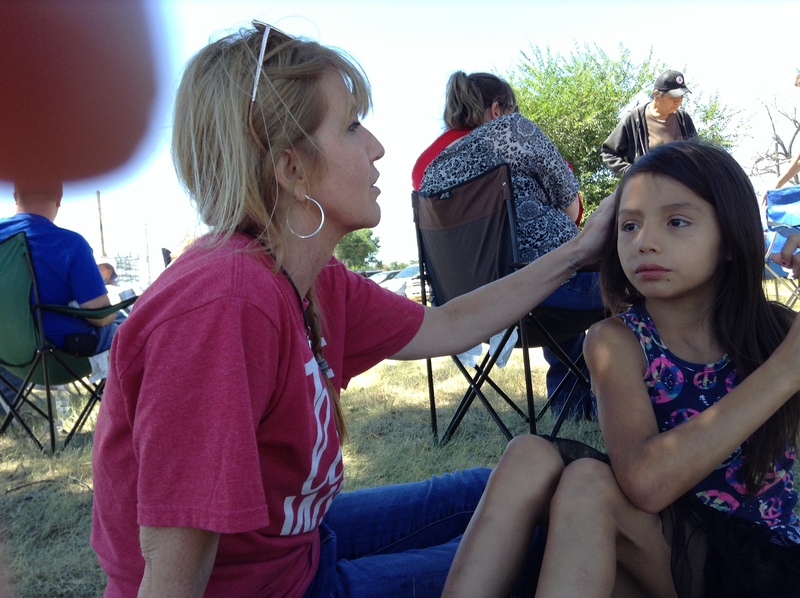 I was blessed to be asked to pray with a young mother who had just accepted Jesus into her heart. However, I was asked to join a couple of other prayer warriors to pray off the spirit of suicide. She had lost her young son as a toddler and was in a state of depression. We prayed with her for a long time and talked of how she needed to rise up and be there for her other children and teach them about Jesus. To speak life and do positive things in her son’s memory. We exchanged contact information. 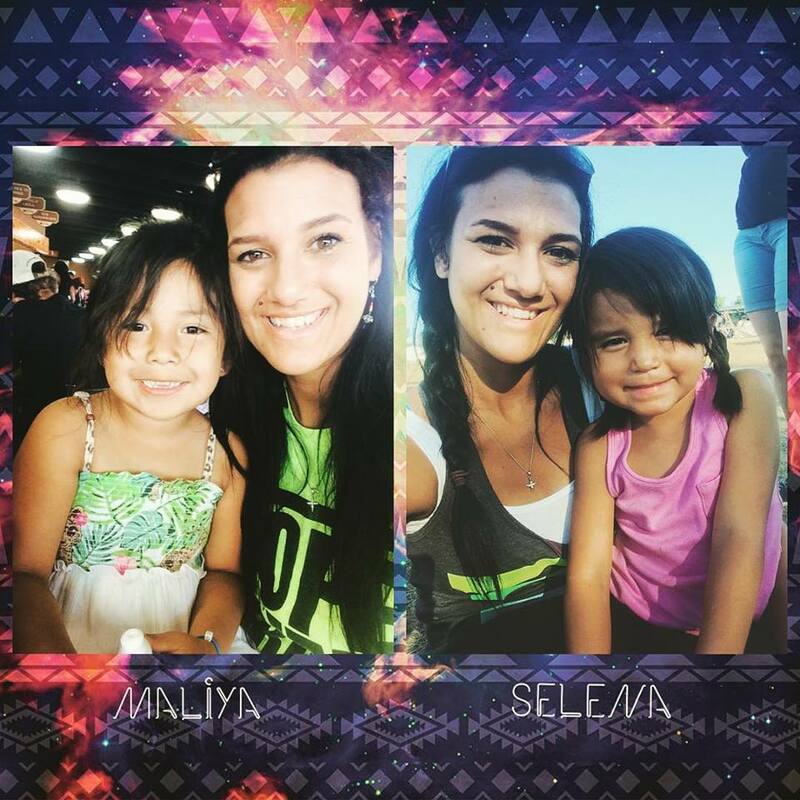 I have kept in touch with her since I left and am blessed to have a new friend in South Dakota! I plan to go back and visit these amazing people I met someday, and hopefully take my family to meet them. 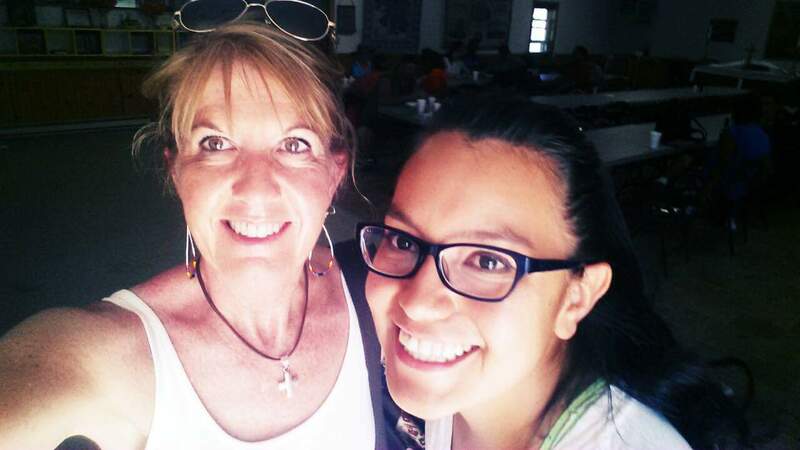 Inside the church with Rhoda – her beautiful granddaughter Corrinna and I. 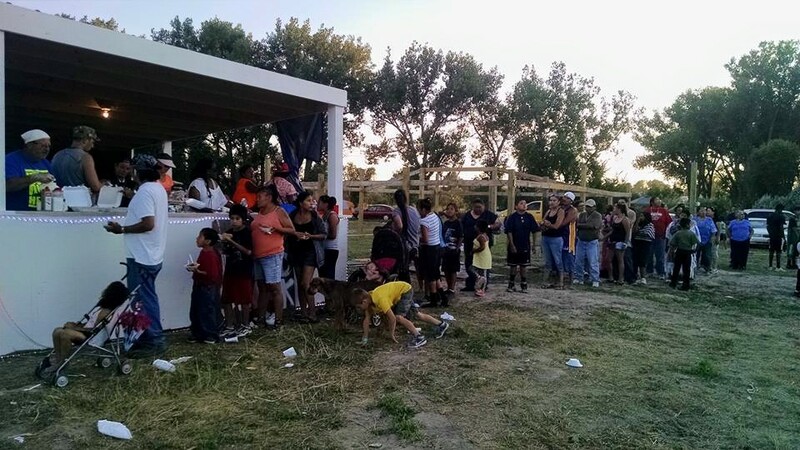 We served food Friday at the Pow Wow with a local group who handed out free meals for both lunch and dinner. These were some hard working people giving back to their community! There were lines of hundreds each meal. 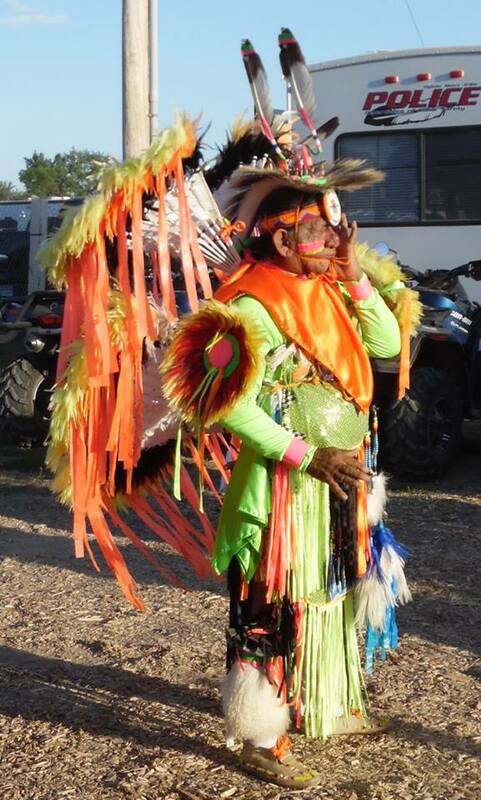 I also got to enjoy my first Pow Wow. 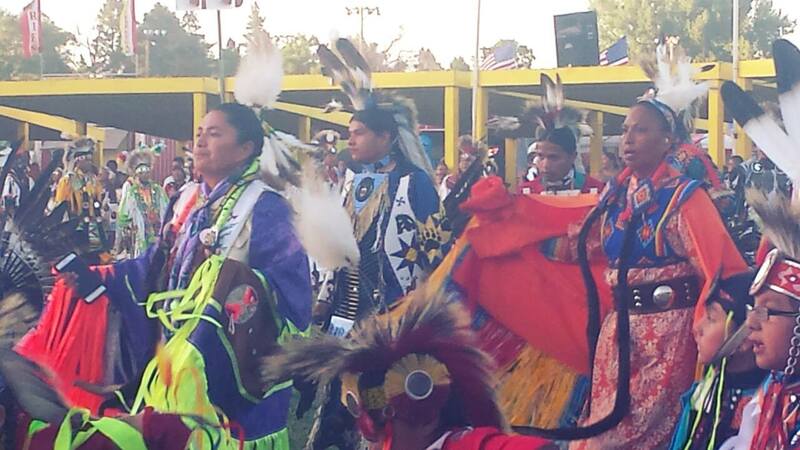 I felt honored to be there and witness such an amazing display of dance and song and pride in their heritage. A friend and I discussed on the walk back to the campground how God would so love if we worshipped that intensely…. with that much love and conviction. 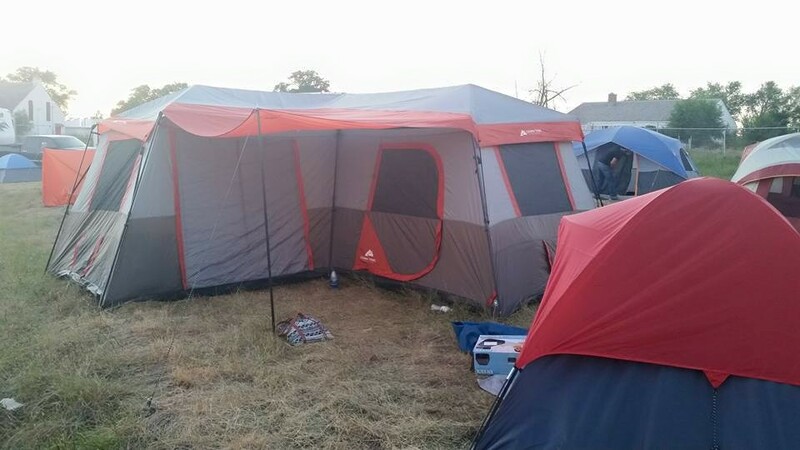 Day 7: August 1st – We got up early (5am early) and packed up our tents and walked the 2 mile hike to take our showers. We came back and put everything on the bus and headed down to watch the parade. 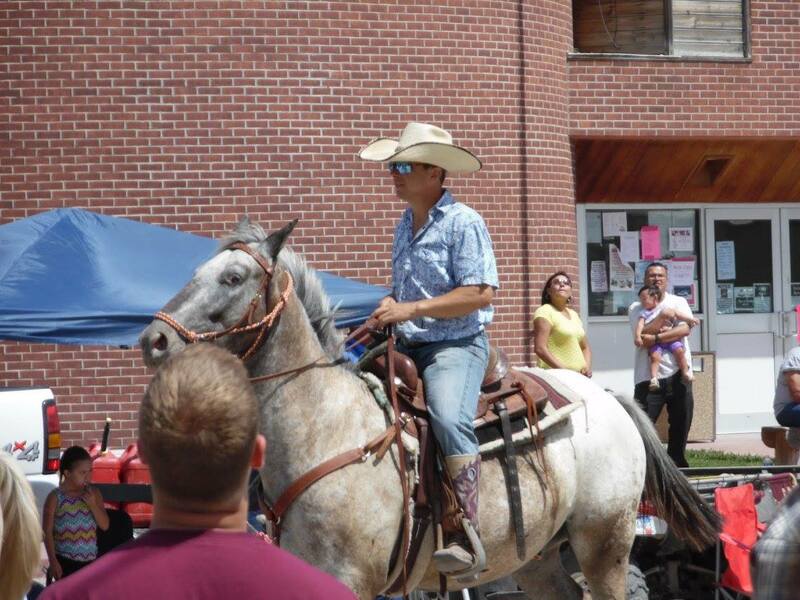 Pastor Lawrence was going to ride a horse in the parade. He told in a sermon upon his return how much of an amazing experience it had been to ride in that parade (after he taught the horse who was boss) and how when the parade was over, they all went full speed on their horses across open fields. I had a good belly laugh this day as little 5 year old Elvis walked up to his dad trying to get a horse to settle down. Elvis was sporting his cowboy boots and hat as he pointed his finger at the horse and without flinching said “Horse, you have two options! You can go meet Jesus or you can let this man ride you.” I’m pretty sure he will be the next Horse Whisperer! Out of the mouth of babes. We left immediately after the parade and the rest of the day was our “Free Day” as we went to see Mount Rushmore before heading to Sturgis. Mount Rushmore was so breathtaking! One more item to cross of my bucket list. I was in awe of how those men were able to carve that mountain to look like the presidents. I mean if you mess up with modeling clay, you just start over. But with a mountain?!? You have one shot! If George’s nose had been off to the right of his face – game over! Was so thankful that the leaders blessed us with this stop on our journey. 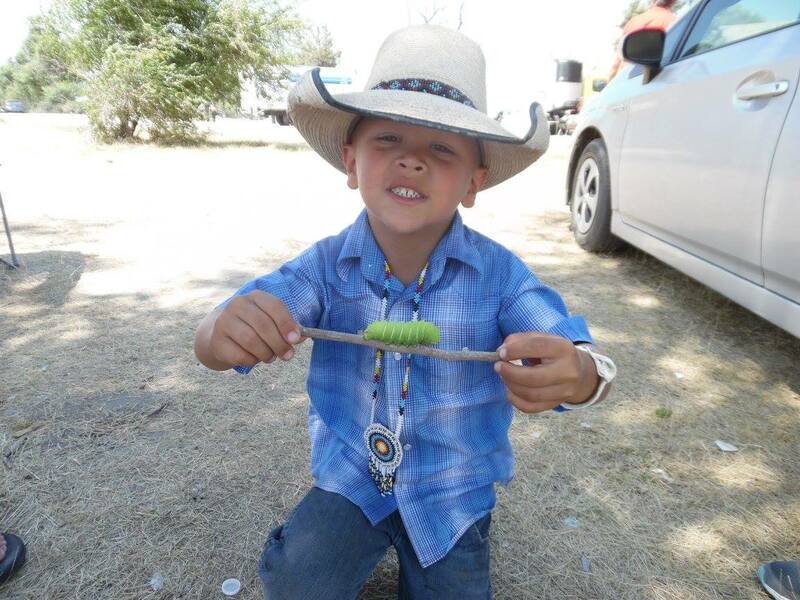 Other Special Moments from my journey to Pine Ridge…. Marissa and Mashayla…. 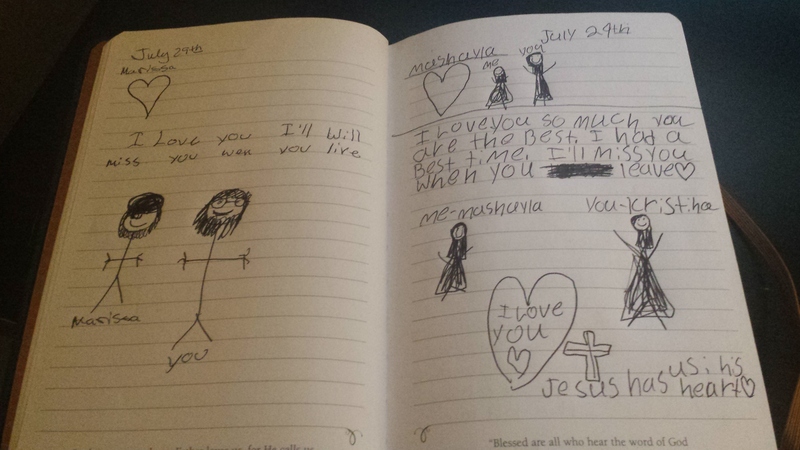 I miss hearing those precious little voices “Kristina! Kristina!” I would hear them sometimes before I saw them and then they would come running with arms outstretched and ready for a big hug! 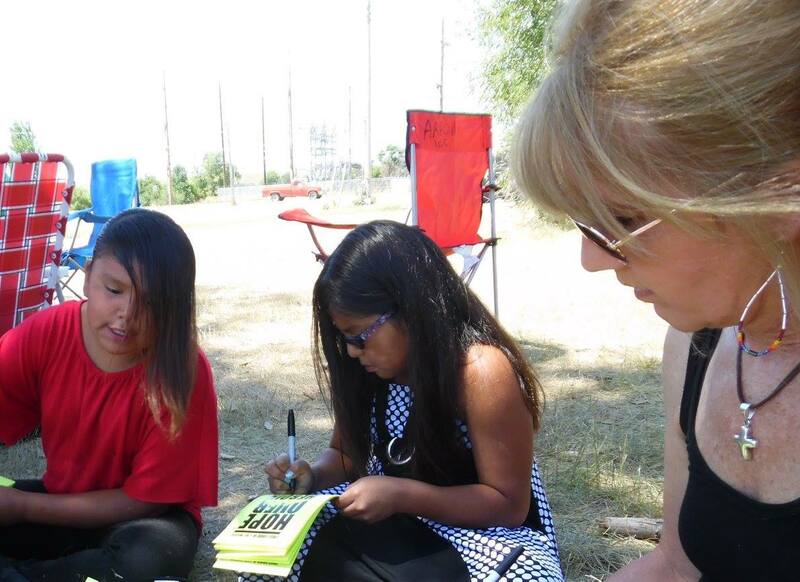 They helped me work on the flyers we handed out and as we sat under the shade tree and talked one day, they drew a picture for me in my journal. Upon my return home, this is one of my most precious souvenirs of my time in Pine Ridge. THE Cop… We met the nicest cop in the town! In fact, that day, he was the ONLY cop in town. He told how he alone was patrolling over 11,000 people in that town and 25 miles North and West this particular evening. He said the weekend before there had been homicides, suicides and a car wreck. 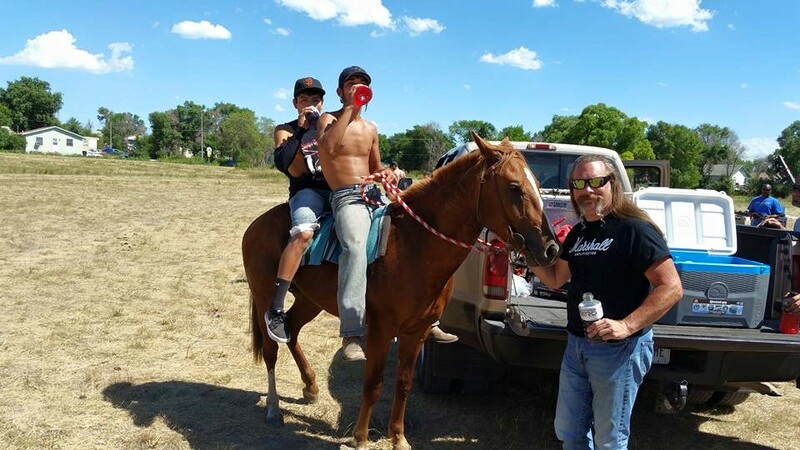 However, he felt the locals would be on their best behavior this particular weekend because if they got arrested and thrown in jail, they would have to stay in jail the weekend and miss the Pow Wow. 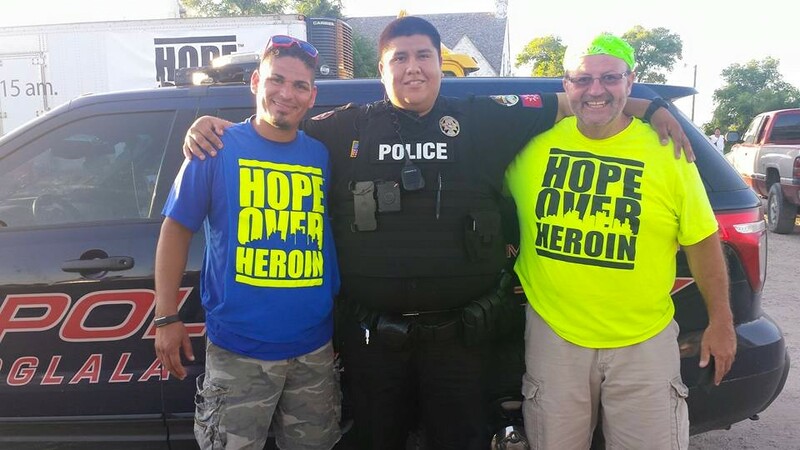 He did say 20 more officers were coming to help out during the Pow Wow. While touring with Pastor Mike we went past a new building that had been there a year. It’s their jail and justice center. Prior to last year, if you got a traffic ticket, you didn’t pay it because there was no one to take the money. Just this past year has the community been able to hire someone to work in the justice center and collect the money for the traffic tickets. One day while in this coffee shop Alicia and I witnessed to and prayed with a woman in the bathroom who was visiting from out of town for the Pow Wow. There was also a day a bus driver asked if we could pray with him. He had just buried his step son the month before, a victim of suicide. I’m sure we stood out in town, and it wasn’t long until people started to understand that we were there for them. 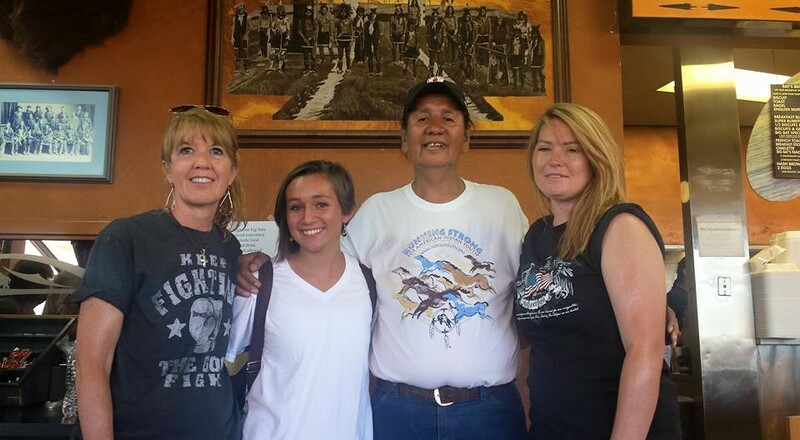 Thank you for taking a few moments to share in my journey to Pine Ridge. As you read this you may have been thinking “Wow! I wish I could go on a missions trip!” While I enjoyed this trip and feel we were meant to go, God also spoke this to my heart when I got back as a gentle reminder; I led you to go on this trip for many reasons. But as you know, there are lost and hurting people needing hope everywhere you go, every day. 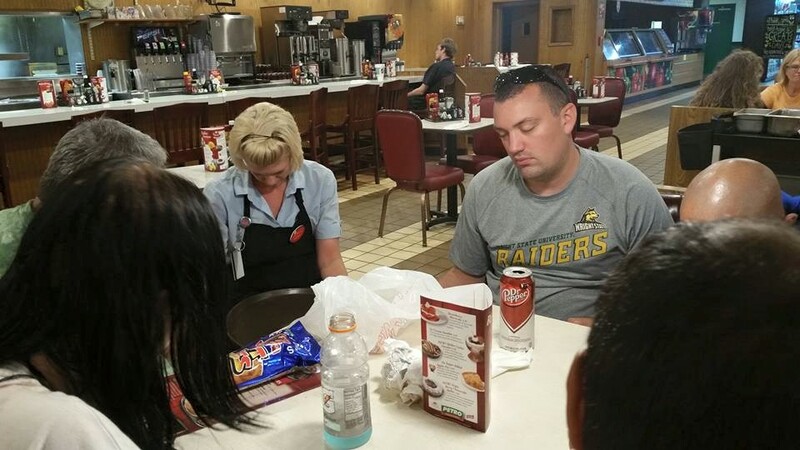 If you can pray with a person in a gas station in Iowa or South Dakota, you can pray with one at the gas station a block from where you live. You were on a “mission” and you were looking for the hurting and ready for those divine encounters. Don’t get so wrapped up in the auto pilot of your day that you don’t wake up every day expecting to have a divine appointment, a Jabez moment, right where you are. If we wake up every day with a sincere desire and say “God use me today.” He will. It may be in a simple act of kindness to a complete stranger. It may be a phone call to a friend in need. It may simply be hugging and loving on a child and saying “You are special”… (never underestimate that us adults need that sometimes too!) 🙂 All you have to do is show up ready to give and God will do the rest. I am reminded of one of my favorite sayings…”They may not remember what you said, but they will remember how you made them feel.” 5 years from now, they may not remember our names. But the memory of a group from Ohio, coming to show them God’s love and hope, will forever be in their hearts. Thank you God for this journey…..